书籍简介: Like it or not, every company finds itself a pioneer in the digital frontier. And like all frontiers, this one involves exploration, potentially high returns……and high risks. Consider this: according to Computer Economics, the worldwide economic impact of such recent attacks as Nimda, Code Red(s), and Sircam worms totaled $4.4 billion. The \\\\\\\\\\\\\\\\\\\\\\\\\\\\\\\\\\\\\\\\\\\\\\\\\\\\\\\\\\\\\\\\\\\\\\\\\\\\\\\\\\\\\\\\"Love Bug\\\\\\\\\\\\\\\\\\\\\\\\\\\\\\\\\\\\\\\\\\\\\\\\\\\\\\\\\\\\\\\\\\\\\\\\\\\\\\\\\\\\\\\\" virus in 2000 inflicted an estimated $8.75 billion in damage worldwide. The combined impact of the Melissa and Explorer attacks was $2.12 billion. Companies were hurt as much in terms of image and public confidence as they were financially. Protecting the \\\\\\\\\\\\\\\\\\\\\\\\\\\\\\\\\\\\\\\\\\\\\\\\\\\\\\\\\\\\\\\\\\\\\\\\\\\\\\\\\\\\\\\\"digital frontier\\\\\\\\\\\\\\\\\\\\\\\\\\\\\\\\\\\\\\\\\\\\\\\\\\\\\\\\\\\\\\\\\\\\\\\\\\\\\\\\\\\\\\\\" is perhaps the greatest challenge facing business organizations in this millennium. It is no longer a function of IT technologists; it is a risk management operation requiring sponsorship by management at the highest levels. 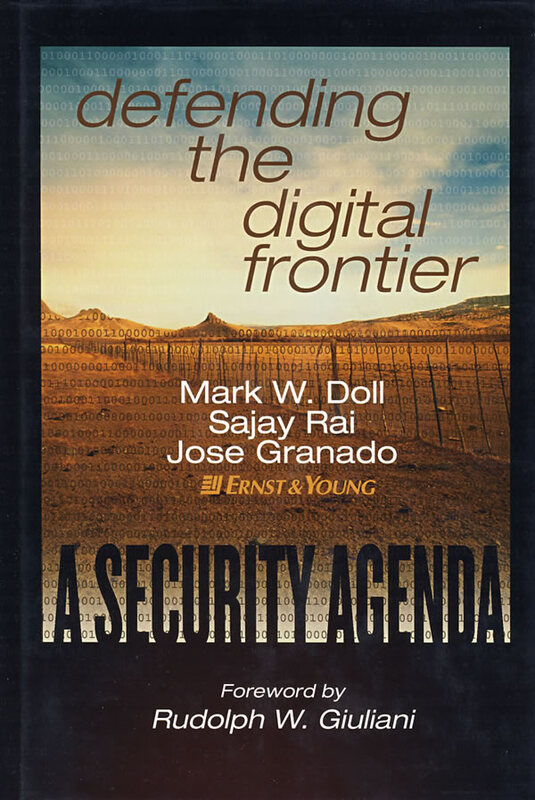 Written by leading experts at Ernst & Young, Defending the Digital Frontier: A Security Agenda deconstructs digital security for executive management and outlines a clear plan for creating world-class digital security to protect your organization’s assets and people. Achieving and defending security at the digital frontier requires more than just informed decision-making at the highest level. It requires a willingness to change your organization’s mindset regarding security. Step by step, Defending the Digital Frontier shows you how to accomplish that. An intrusion is bound to occur to even the most strongly defended systems. Will your organization be prepared to react, or lapse into chaos? Defending the Digital Frontier introduces the Restrict, Run, and Recover® model that guides organizations in formulating and implementing a clear, enterprise-wide Agenda for Action to anticipate, detect, and react effectively to intrusions. You will learn how to roll out an effective Security Awareness and Training Program, establish Incident Response procedures, and set in place digital security teams to control damage and manage risk in even worst-case scenarios. The digital threat knows no borders and honors no limits. But for the prepared organization, tremendous rewards await out on the digital frontier. By strengthening collective digital security knowledge from the top down and developing a rock-solid, comprehensive, on-going security agenda, every organization can build a secure future. Defending the Digital Frontier will get you there.